After four successful days of game viewing, we are now spending the night on the rim of the Ngorongoro Crater with a spectacular view into the vast crater. We were able to see the big five - lions, cheetah, leopard, elephants, and from a distance, the elusive rhino. Today we'll start heading back towards Moshi with a few stops along the way to visit elephant caves, a coffee plantation, and of course some shopping at a few curio shops. Our time in Africa is winding down and we'll all be home in a few days. It has been a wonderful trip. After a great night at Lake Manyara, we drove to the Serengeti via the Ngorongoro Crater. Along the way we visited a Masai village. Today we saw lions eating a kill, a leopard, two cheetahs, many giraffes, zebras, elephants, loads of birds, gazelles, and other animals. We're tent camping in the middle of the Serengeti tonight, hoping to hear lions roar! We're all around the bonfire right now, enjoying our favorite beverages. Tomorrow we're off for another day of exploring and viewing wild animals in the Serengeti. We miss everyone at home and hope you are well! Jambo From Uhuru Point (19,341 ft)! Team Mountain Goats is at the top of Kilimanjaro! We’re all doing well - tired but happy. The wind is howling but it’s clear and beautiful. We summited in about 7 1/2 hours. Couldn’t have done it without our Tanzanian guides Ringo, Bruce, Sebastian, and Ramon. Mark raised a flag for non-violent Durham. We’re all taking pictures. We’ll be on our way soon. Long day ahead—back to Barafu Camp for food, sponge bath and rest, then down to Mweka Camp at 10,000 ft.
A BIG thank you to everyone cheering us on! We felt you! Team Mountain Goats, over and out! 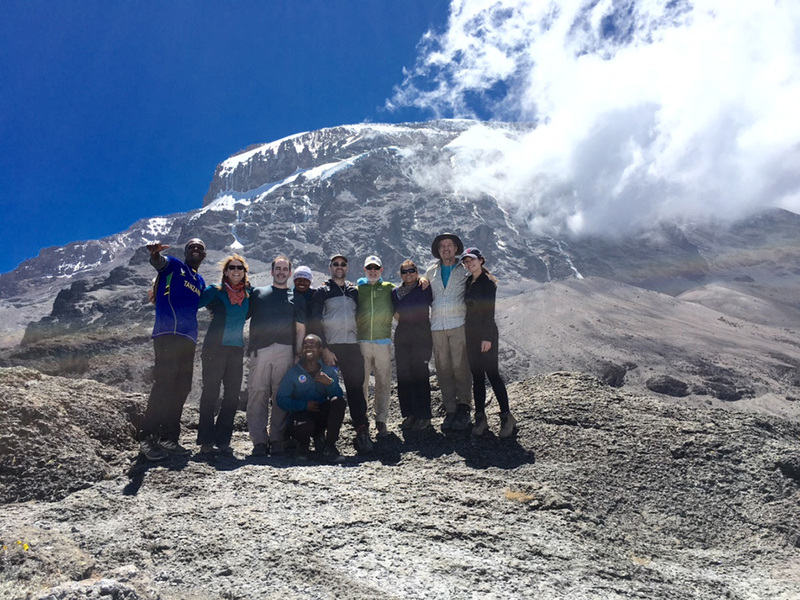 Team Mountain Goats is at Barafu high camp (15,500 ft). Everybody is feeling good and ready for the summit attempt. We’ll leave around 11:30 pm tonight. We hope to reach the summit in about 7 hours. It’s a clear night with no wind, about 30 degrees F, and no snow. We got really lucky with weather compared to the initial prediction of rain and snow all the way up. Of course it will be much colder on the summit at over 19k feet. We’re resting for a few hours before heading out. We’ll have some hot tea and snacks before we start the ascent. Brigitte, Keith and Kyra send their love and a big hello from the snows of kilimanjaro to all their family and friends following their adventure- to Kate and Alicia, Gunther, Irmgard, Melanie, Monica — Alex and Liam—you could so accomplish this climb! Kyra says hello to Daddy and Cathy. I’m surviving and almost at the top! Miss you and love you! Team Mountain Goats- over and out, onward and upward! 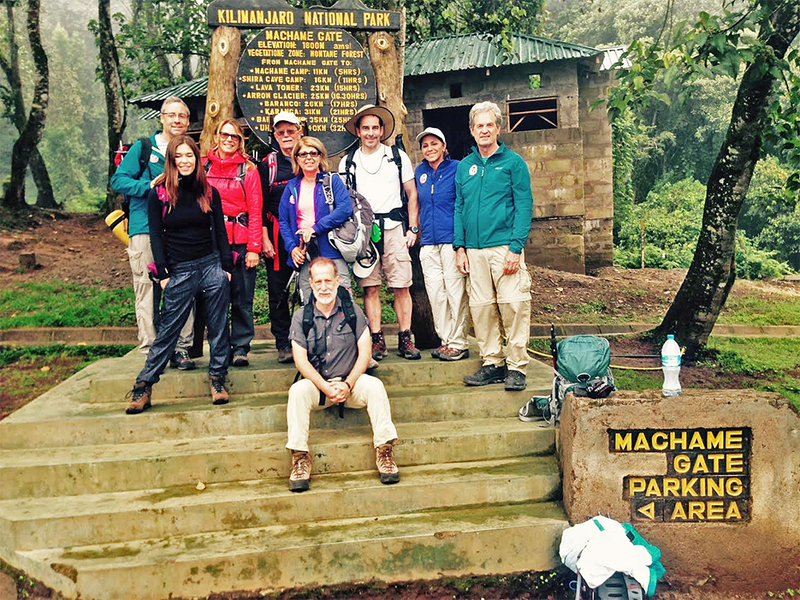 Team Mountain Goats has arrived at Karanga Camp after climbing the infamous Barranco Wall. Everyone did well. We're acclimatizing and can feel our red blood cells growing by the day. We're resting now. Today was sunny and tonight is beautiful -- stars above, clouds below. Brian and Fereshteh send their love to Sonya, Monica, Mike, and the grandkids. Fereshteh hasn't decided to divorce Brian yet. Mark was able to help a few porters along the way with medications and water. We all send a BIG SHOUTOUT to our African Guides--Shane's old friend and head guide Bruce, Ringo, Sebastian, and Ramus. Over and out, Team Mountain Goats, onward and upward! Greetings from Barranco Camp (13,000 ft)! It was a long but great day today. Windy and cold but happy to report no rain for the past 2 days. We had stunning views of the Shira Plateau as ascended toward the Lava Tower (15,000 ft). We had a good lunch and Mark and Keith climbed to the top of the Lava Tower with Ringo, one of the guides. Brigitte and Kyra are making a video. Fereshteh and Brian had a great day. We're having dinner now and settling in for the night. Tomorrow we climb the Barranco wall to Karanga Camp. Missing our family and friends! We made it to Machame Camp (10,000 ft) yesterday afternoon, very tired after a long day in the pouring rain. We had a good night’s rest and headed to Shira Plateau this morning. The hike to Shira Plateau Camp (12,000 ft) was beautiful. We took an endless number of pictures. Had a filling lunch and some folks are napping now. Mark and Shane explored Shira Cave. David and Maria are doing well but have decided to go down tomorrow to enjoy Moshi Town. We’ll meet up with them in a few days for safari. The rest of us will continue up. Tomorrow will be a long day through the Lava Tower Pass (15,000 ft), dropping back down to Barranco Camp (13,000 ft). Team Mountain Goats have all arrived now in good spirits. Everyone is looking forward to starting the climb tomorrow. Today several folks will visit a local orphanage and donate some valuable time and items to kids in need. Later, after our final packing, we'll have a climb briefing with our local Tanzanian guides. Our next dispatches will be via satellite phone and getting a good connection may be difficult. If we don't post a dispatch don't worry-- assume satellite connection issues and not an indication of problems! Our teammate Mark is doing this climb to raise money for a Durham non-profit called Nonviolent Durham. If you would like to support his efforts please check out the link below. Next stop Kilimanjaro Machame gate. Oh wait- it's August 8th and we're already there! Wish us well!!!! Team "Mlima Mbuzi" (Swahili for Mountain Goats) will start our Kilimanjaro climb and safari in a few days. After flying many hours we'll all meet up in Moshi, Tanzania on August 6th and have a few days to rest, sightsee and recover from jet lag before beginning our climb. We have a fun team of family and longtime friends - David and Maria; Fereshteh and Brian; Brigitte, Keith, and Kyra; Mark, myself, and a first-rate team of local African guides. We will be doing the Machame Route (AKA the “Whiskey Route”). We'll take seven days to traverse about two-thirds of the way around the mountain, hiking through five diverse ecosystems. We’ll start in the dense rainforest, hike through the heather, moorland, alpine desert zones, and finally reach the arctic zone on the summit. After the climb we'll have a day to rest and shower before we start our safari. Please follow along with us.